I've decided that my living room needs a punch of color. That's one thing about blogging, when you post pictures of a room you start to notice where you can make improvements. Since my newest project is going in that room, it is the perfect place to add color. I like the paint color that I used on this project. some more of my Halloween decorations. Some of you showed a real interest in my old PB light fixture. I suppose I could sell it. But I'm warning you, it's pretty heavy and would cost a bit to ship. my my Joy...Is there anything that you can't do...harvesting your own pumpkins and gourds??? I love that long thing with all the pumpkins in it...that is so cute!!! 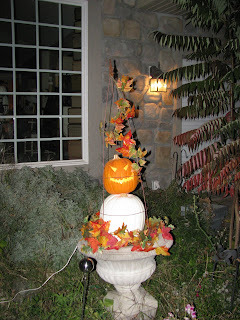 AHH...your decorations are just wonderful...you should submit to a magazine...I am serious!! If you don't decorate for a living...you should!!! I would hire ya! That long green piece is awesome. I love it. I've never seen anything like that before. seriously...how wonderful is all that decor? oh my word...gorgeous. love it. 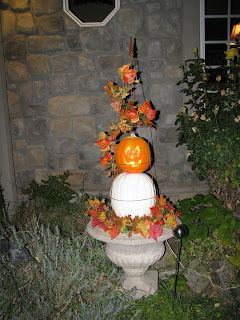 I love the pumpkins on the front porch! 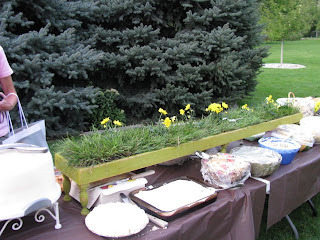 When you made the long green tray/planter for the shower...it was my favorite then...NOW I love it even more seeing how you used it again. Everything is BEAUTIFUL! Love your new creation! Everything on your post today is fabulous! I meant to say, that is a bountiful harvest. Very nice! Very cool Joy. Since we just moved in July we didn't have the time period to plant pumpkins in time. But we plan on having our own next year. I'm thinking about using the seeds from the pumpkins we bought this year, along with packets to see if we can grow them that way. I want a wide range just like you have. They're beautiful and the best is they are yours. Love all your pumpkins. How great to grow your own!! I'm so impressed! Still love the light. It's hard to tell size wise - if it would fit in a 12" x 12" x 5-1/2" box it would only be $13. Bigger than that and they charge by weight and it could get expensive I guess. We're on a tight budget in a new home!! I love all of your decorations.. to cute.. I LOVE it all!!!!! 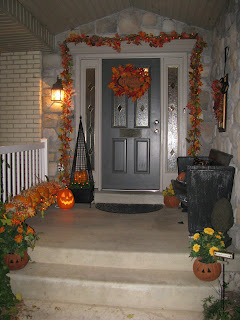 Loved seeing your front porch all Halloween-ish and inviting!!!! What an impressive harvest! I love the pumpkins in the green box, great contrast! Ah Joy! You are an inspiration...I love your "grass box" with all your pumpkins in it. It's just BEAUTIFUL! Joy I love all your projects. You should keep an album of pictures with all your amazing ideas and things you have created while blogging and before that too. You are one creative woman! You go girl. 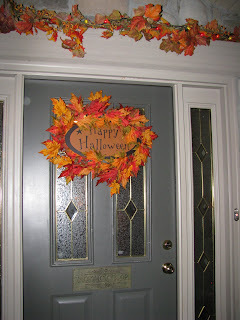 Hey we started a Fall Decorating Group on Flickr where everyone can post their fall pic's. You should post these pictures they are wonderful. I just love looking at all your decorations; especially your mantle! It makes me quite jealous that I have not a bit of creativity in me. :-/ But I sure do love reading your blog and other's because at least then I can copycat. :) Thank you for sharing! I'm impressed that you GREW all of those pumpkins and gourds in you OWN garden!!! I absolutely LOVE your porch! 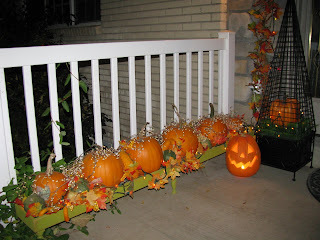 I love how you displayed the pumpkins! It looks awesome! You have got to be one of the most creative people in the USA! I love popping in to see what's new - I just wish I could get some of these things done myself! Oh well, at least I can visit you and feed the inspiration. Love the fun topiary. Great idea, and I really love that green tray with the fallish items. Great centerpiece or accent piece. It would look great in front of a fire place. I would love to be able to harvest my own pumpkins and gourds! Someday:) Your front porch looks great! Wow it really looks great! Congrats on all the goodies you got from your garden. It looks amazing! it even more with the pumpkins. Joy, now that's really amazing that you grow your own pumpkins too. Way to go! They sure are cute. Too cool! Love all of the outside decor. So fun and festive but totally classy. Love it! I wouldn't expect to see anything else though. Wow, you grew your own pumpkins! I need to try that next year! Are they hard to grow? When do I plant to have them in October? Your porch looks lovely! I love the garland. I LOVE the pumpkins. Polka dots are so fun! Come take a peek at my blog...I gave you some props! So cute! I love all of your fall decorations. You are so creative! I am in love with that planter/trough!! So much fun!!! What are you planning to do in your room? Paint the walls?? Love all your pumpkins and gourds! I'm so jealous...I tried planting pumpkins this year and they had gorgeous flowers and were then eaten by bugs. Sigh! I'll try again next year! Thanks for sharing. Everything looks spectacular! LOVE it all! Especially the pumpkins on your porch. I loved everything! I had to save the whole page in my inspiration file. You are SO clever! 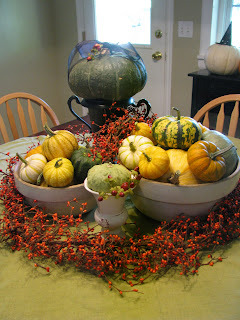 How wonderful that you had that collection of pumpkins and gourds from your garden!!! 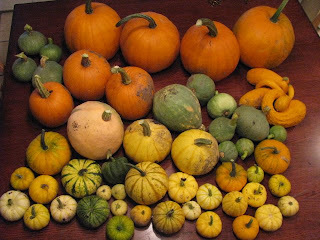 I would definitely love to add some gourds to our garden next year!